An Iranian cleric said he was beaten by a woman in the northern province of Semnan after delivering a warning about her immodest style of dress, Bloomberg News reported Wednesday, citing the Iranian Mehr news agency. The woman, who was walking down the street in the town of Shahmirzad, east of Tehran, was asked by the cleric to cover herself up. In response, the woman told him, "you cover your eyes," and when the cleric repeated his warning, she pushed him to the floor. "I politely asked her to cover herself up," Hojatoleslam Ali Beheshti said. According to him, her head was not covered properly, so he repeated his remark. "Not only did she not cover herself up, but she also insulted me. I asked her not to insult me anymore, but she started to yell at me and threaten me. She pushed me and I fell on my back." Beheshti said that due to the incident he was hospitalized for three days. 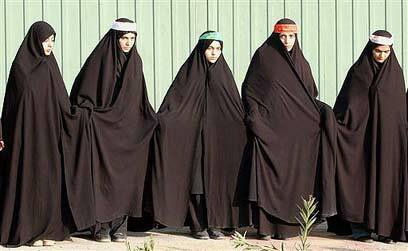 In 1979, as Shiite Muslim religious leaders rose to power in Iran, modesty regulations were instated, requiring that women cover their bodies and heads, in order to “preserve society’s morals and security.” In order to enforce modesty regulations, police forces run constant patrols to make sure the Islamic dress code is maintained. In recent years, however, it seems that Iranian women, especially young women, are starting to express their resistance to the dress code. Women are seen in public with nail polish, make up, and colorful head covers. Another form of resistance is standing up to criticism, as seen recently in online videos depicting women fighting against dress code enforcement. According to the Mehr news agency, Beheshti is not the first cleric to be beaten up after delivering a warning. See all talkbacks "Iran: Cleric beaten by 'immodest' woman"